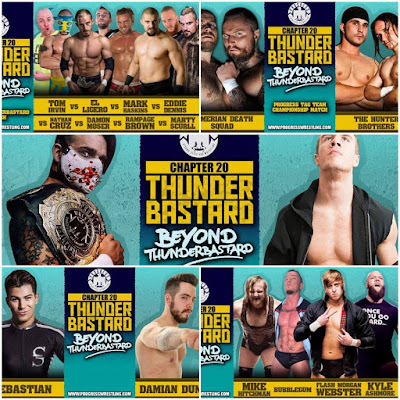 Just under nine weeks removed from Chapter 19: Super Strong Style 16 Tournament Edition, Progress Wrestling was back at the Electric Ballroom in Camden, London, England to present Chapter 20: Thunderbastard - Beyond Thunderbastard. 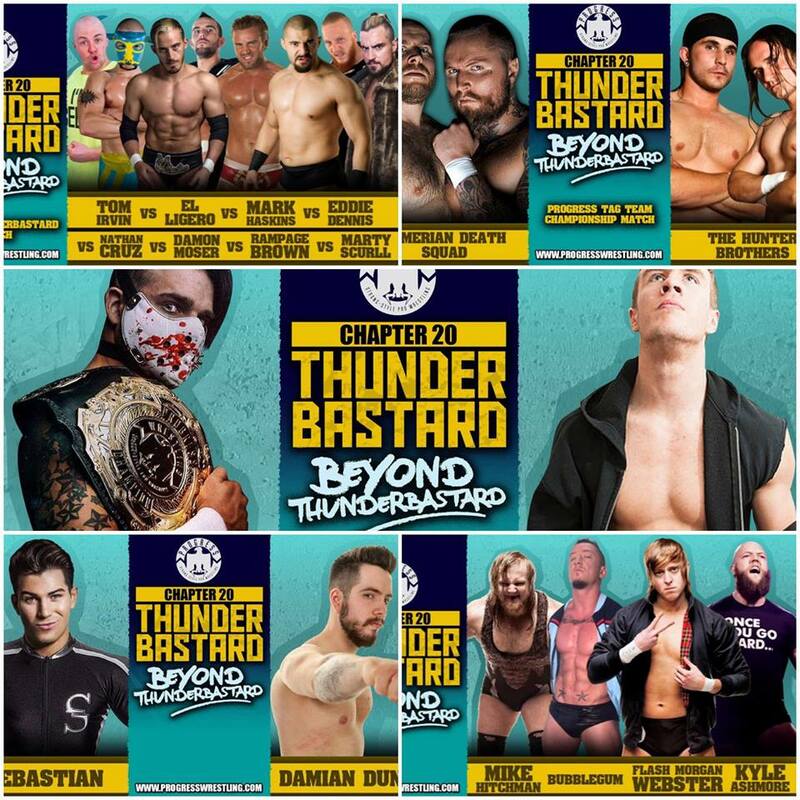 With the hated Jimmy Havoc putting his title up against Super Strong Style 16 Winner, Will Ospreay, as well Bubblegum, Damon Moser, Eddie Dennis, El Ligero, Flash Morgan Webster, Kyle Ashmore, Mark Haskins, Marty Scurll, Mike Hitchman, Nathan Cruz, Rampage Brown, The Sumerian Death Squad, The Hunter Brothers, Tom Irvin and more in action, this show was always going to be amazing...wasn't it? It's one of the best introduction in the country and always add an extra level of hype to the show. As soon as The Imperial Death March begins and straight through into Jim Smallman's opening monologue, the anticipation grows to an almost unbearable level. Smallman was once again impeccable at working with the crowd, he clearly knows his audience and being a professional comedian probably helps a little as well. This time we also got the introduction of a brand new commentary team, with Progress recording commentary live for the very first time as Glen Robinson and RJ Singh took their place at the top of the ramp. This worked nicely as the opening bout, with the pair going back and forth, with big strikes and a number of pinfall combinations. With the pair both getting loud support from the Camden crowd, the Electric Ballroom was rocking from the very start, as the pair put together a solid encounter. From the laugh out loud moment where Dar refused to pray for Eaver because he's Jewish, to the hard-hitting action that filled the majority of the bout. A Champage Super Knee Bar from Dar, pretty much out of nowhere, worked as close call, with Eaver selling the knee after the hold making me very happy. Perhaps surprisingly, Eaver was able to pick up the win with his Clothesline From Heaven. I would have liked this one to have gone a little longer, although with Dar having to jet off to Glasgow for ICW's Shug's House Party 2, it's understandable why this one went short. After the bout, Dar seemed to be saying goodbye to the crowd, placing a Chapter One t-shirt over the top rope and waving as he left the ring. An interesting development that has yet to be fully explained, I'm not sure if many in the crowd knew exactly how to react. If this was Dar's last match for a while in Progress, then it's a shame that his scheduled bout with Dave Mastiff didn't happen here, as it would have been sweet to see the end of that particular storyline. This was lightning quick, pro wrestling thrill ride, from start to finish. Mike Hitchamn, Bubblegum, Morgan Webster and Kyle Ashmore went hammer and tongs for almost fifteen minutes, producing some, stand-up silly action. There was multiple dives to the outside, a terrific four-way strike sequences, a reverse rana from Webster and a package piledriver variant of the Meltzer Driver from Hitchman and Ashmore. Whilst a few slips on the ropes hurt the pacing of certain spots, every time the performer was able to recover without too much effort. Whilst it was Webster who was able to pick up the victory with a 450 splash onto Hitchman as he attempted to pin Bubblegum, it was the later who stood out as the star of the match, for me. In only his second appearance for PROGRESS, Bubblegum has been able to garner a decent amount of heat, winding up the Camden faithful with his Manchester City loving, nutsack grabbing ways. Everything Bubblegum did looked lovely, his strikes in particular have become some of the best in the country and he worked nicely as a foil for the other three men in the bout, whilst still able to remain looking like a star. With PROGRESS heading to Manchester in December, I'd expect him to play a major part on that show. I was in, what would seem, a rather unique situation during this match. 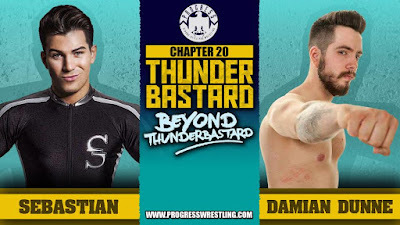 Unlike most of the crowd, I am very familiar with Damian Dunne, from my trips to promotions like Kamikaze Pro, Fight Club: Pro and Shropshire Wrestling Alliance, and this was my first opportunity to see Sebastian in a match. 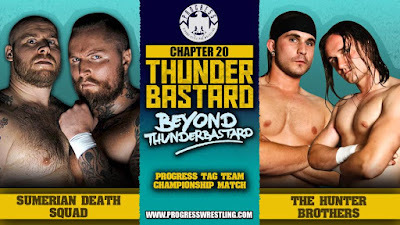 On the other hand, the PROGRESS faithful were very much aware of Sebastian and his GZRS's partner Tom Irvin, showering them with love throughout the match, whilst Dunne was met with a mixture of mild heat and utter indifference from the outset. Dunne did a decent job of getting the crowd into his stuff, but they never seemed to completely warm to him. The match itself was a decent encounter, which really heated up in the closing stages. Sebastian continued his Damian Dunne facts over from Twitter in the match, all of which were genuinely funny, although a fan's attempt to follow up with the gimmick didn't hit the spot (especially when resorting to just repeating facts from Sebastian). The highlight of the bout was a tremendous false finish, that saw Dunne able to take advantage of the GZRS confusion at being unable to find a table (after a Dudley Boyz tribute) hitting a springboard double knee facebreaker for two, with the crowd seemingly convinced that Dunne had the match there. Winner - Sebastian via pinfall in 8 minutes, 58 seconds. Before the Tag Team Championship bout could get underway, Jim Smallman revealed that the Tag shield's had been "confisticated" by customs as the Sumerian Death Squad entered the country. 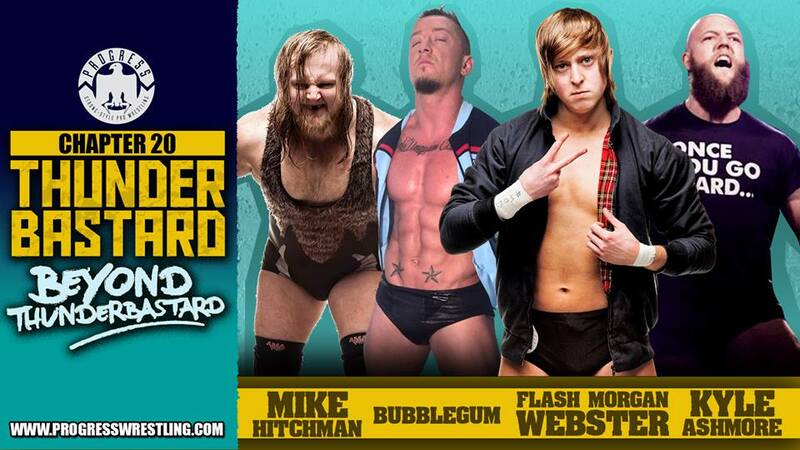 Just as you'd expect from two of the finest tag team's in Europe, this was a silly, silly tag team match. 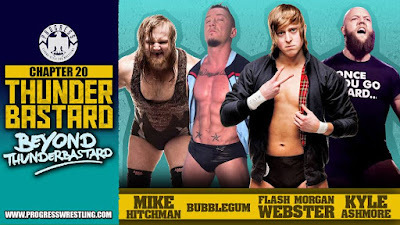 Some of the most ridiculous near falls and false finishes that one could every hope to see, with both teams experience together and opposite each other (they've previously clashed in WXW, Southside and Fight Club: Pro) shining through for the entire bout. With the four men pacing everything down to a tee, allowing a slower opening to set the foundation for the blistering pace of the final five minutes or so, which saw all four getting involved, the crowd was whipped into an absolute frenzy by the finish of the bout, with it being difficult to not get caught up in action. Similar to the experience with Damien Dunne earlier in the show, it was strange to see The Hunter Brothers not be one of the most over acts on the card, with the crowd solidly behind Michael Dante and Tommy End from the very start of the match. As the pair have only made a handful of appearances in PROGRESS before (all their previous Chapter appearances ending in a loss), it was clear that the fans hadn't quite warmed to the brother's from Tipton. This match seemed to change things, with the pair receiving a standing ovation for their considerable efforts in the bout. I hope there's more opportunities down the line for The Hunters as they clearly have a lot to offer an expanded PROGRESS tag division. Winners - Sumerian Death Squad via pinfall in 13 minutes, 48 seconds. Following the bout, Jim Smallman would lead us into the intermission bringing the first half to a close. During the interval, Jim's wife Stacy bravely had her head shaved for MacMillan Cancer Care, you can donate at the following link https://www.justgiving.com/mrs-smallman/ With the 2nd half intro being kept nice and short, there as one hilarious moment involving the crowd chanting "Jim "The Barber" Beefcake" (in reference to the headshaving) and Jim's quick reply regarding Hulk Hogan. 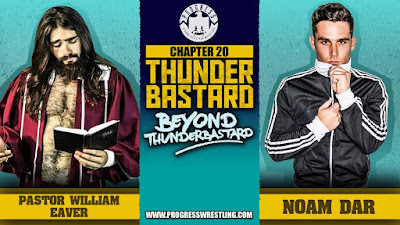 Before the action of the Thunderbastard match could get underway, Smallman's fellow PROGRESS founder Glen Robinson had something to say. Unfortunately, it wasn't happy news as Glen announced that PROGRESS' first trainee graduate, Ali Armstrong, would no longer be competing due to two consecutive injuries. We'd like to wish Armstrong all the best going forward, he'll be missed at PROGRESS and around the country. Of course, this wouldn't be pro wrestling if someone didn't come out to interrupt, and that someone was The Origin's Nathan Cruz, who got some decent heat for his comments about Armstrong. It was Robinson whoever who had the last laugh, with a fiery reply, before making Cruz the first entrant in the Thunderbastard match. PROGRESS' Thunderbastard match is at it's core, a Royal Rumble match, but with wrestlers being eliminated via pinfall, submission and disqualification, instead of being chucked over the top rope. A well-structured bout, that told a solid story throughout. This match was all about The Origin continuing to cause trouble for the rest of the PROGRESS roster, with Nathan Cruz and El Ligero working together throughout. This included eliminating their former stablemate Damon Moser from the match, after Ligero joined the pair in the match. 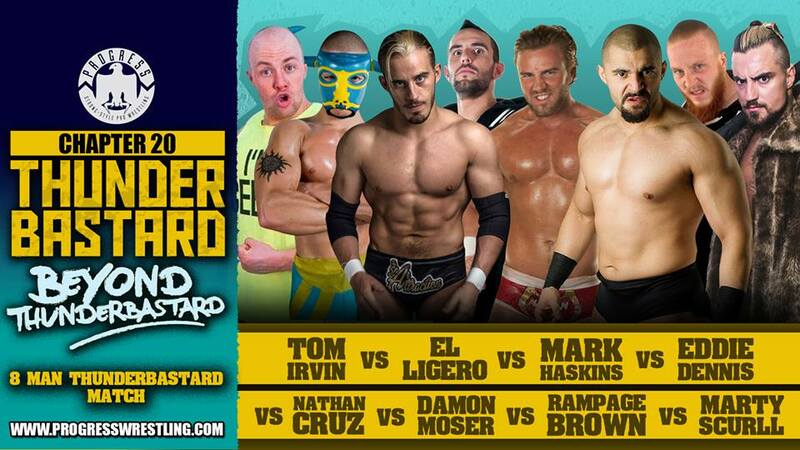 The pop when Ligero was eliminated with a small package, from none other than The GZRS' Tom Irvin was huge. Cruz almost immediately eliminating Irvin had almost as strong a reaction in the opposite direction. A match between the two teams at some point in the future would have the Ballroom rocking for sure. Whilst the story of the bout was strong, the spots and moves placed over the top of it added a little sizzle to the steak. Marty Scurll's trio of suicide dives, a lovely Samoan Drop/Northern Light's suplex from Eddie Dennis and a fantastic tower of doom spot. Dennis and Rampage Brown also brought it, in a great sequence of moves, with the two big men looking on form throughout the match, it was almost a shame to see the pair eliminated when they were. The Pride of Wales elimination directly after being able to joust Brown from the match was particularly disappointing, but seeing as this came at the hands of Cruz, it's safe to say that that was the reaction that was being looked for. With the final two coming down to Marty Scurll and Mark Haskins (following a quality exchange that saw Nathan Cruz eliminated by Scurll), the crowd was split pretty much down the middle. The closing action between the two was focused on Scurll attempting to lock in his Cross Face Chicken Wing, with the move being incredibly over with the PROGRESS crowd. After three or four attempts at the move, Scurll finally seemed to have the match won, only for Haskins to roll over and manage to grab the pinfall victory, ending a solid exchange between the two. With Haskins announced he'd be after a title shot at Chapter 21: You Know We Don't Like to Use the Sit Down Gun in September, PROGRESS now has a fresh face in the title picture, with the former TNA man recieving his very first show at the promotions ultimate prize. Winner - Mark Haskins in 24 minutes, 23 seconds. It was main event time...but before Jimmy Havoc and Will Ospreay got to rip each other apart over the PROGRESS Championship, a special promo package aired on the Ballroom's screen. I was going to write a little about it...but I think it's better watched than talked about...so here it is. If you're not WWE (and sometimes even if you are) big match feel can be a hard thing to get. It's an intangible thing, isn't it? But christ, you know when it's present. It takes a lot of hard work and effort to get, and if you've watched the promo video above you'll see that everyone involved putting together this match has worked incredibly hard for the past twelve months to tell a story that has captivated the fan base of the promotion. Add to that, two incredible entrances and you had a crowd at fever pitch from before the bell had even rung, and despite already watching over two hours of wrestling and cueing for hours before hand, and many travelling from all over the country, the crowd was more than ready to join in with the performers in giving it their all throughout. 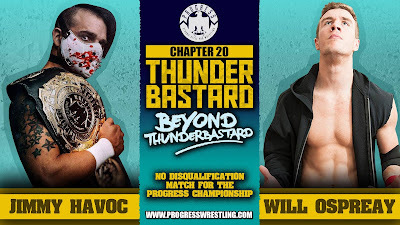 The No Disqualification gimmick worked superbly, with it being a style that Jimmy Havoc is perhaps best known for throughout the United Kingdom and elsewhere and also for playing a big part in Havoc's storyline progression over the last two years. However, this wasn't violence for the sake of it, every weapon shot and every table crash, felt like it had a purpose, and an edge behind it, that is often not there. Tables, singapore canes, steel chairs, thumbtacks all got involved, as well as Ospreay repeatedly sending Havoc into the seating area. The brutality throughout was exactly what the feud deserved. There was also a number of different story elements that came into play throughout the bout, with a handful of nice call-backs to previous events under the PROGRESS banner. Jimmy Havoc taking out not one but two referees stands out as the biggest of these, as he was seemingly intent on having Jim Smallman count the pinfall in the match. There was also the involvement of Havoc's Regression cohorts, Paul Robinson and Isaac Zercher, who caused problems for Ospreay in the later portion of the match, with a nice distraction spot with Zercher coming down the entrance way, whilst Robinson was entering through a side door. Once all was said and done this match was about the superb near falls, and the electric reaction that they received from the crowd. Both men had their opportunities to have the contest won, and there were maybe three or four occassions when the majority of the people in attendance (including myself) felt that either Havoc or Ospreay had managed to pull out the victory. Two acid rainmakers from Havoc and a 450 splash and Red Arrow from Ospreay stand out in particular, with Ospreay's kick outs being just that little bit extra special. If the reaction to some of the near falls was impressive, the reaction to the finish was like something I've never experienced before. When Smallman's hand hit the mat for the third time, following a 630 Senton from Ospreay, (almost) everyone in the building erupted. There was people grabbing random stranger in sheer joy, people falling down stairs and just a straight-up outpour of emotion, like none I've ever seen at wrestling event before. It was crazy. With the babyface roster spilling out onto the stage to congratulate Ospreay in his title victory, we had a fitting end to a superbly brutal, brilliantly dramatic title match, that will be remembered by those in attendance for a very long time. WINNER AND NEW PROGRESS CHAMPION - Will Ospreay via Pinfall in 26 minutes, 7 seconds. 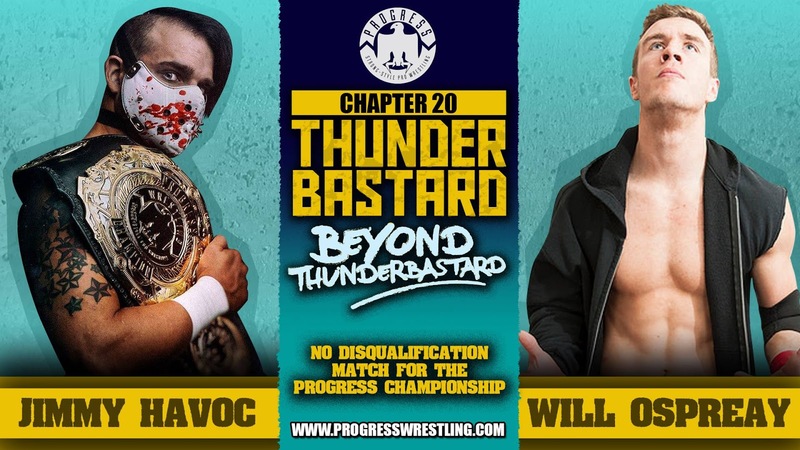 PROGRESS has built a reputation as one of the best promotions in the United Kingdom and Europe, and continues to prove exactly why that reputation is deserved with every show they put on. Ospreay and Havoc, as well as anyone else involved in scuplting that storyline over the last year and beyond, deserves full credit for producing a fabulous main event and some of the best crowd reactions around today. 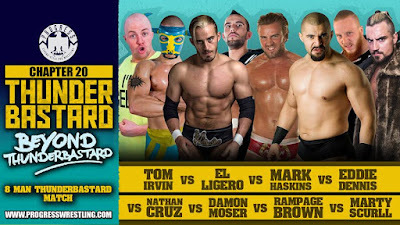 The Thunderbastard match and the tag team title bout also provided strong slices of pro wrestling, both offering a different change of pace to the rest of the show. Throw in a strong undercard, with the Four Way bout standing out as the pick of the pack, and you've got the makings of fantastic show. With just six week's separating this show and Chapter 21: You Know We Don't Like To Use the Sit Down Gun and their first venture of Manchester looming around the corner, PROGRESS is expanding quicker than it has ever done before. If the quality continues to be this strong, they won't have a problem at all. You can find out more about PROGRESS on their website here, as well as on Facebook and Twitter.